How do I recognise ticks in Scotland? I have just realised that I have pictures of lots of things with a Scottish theme – from tea cosies shaped like sporrans to haggis fingers. But I have seldom steeled myself once to photograph a tick here in Scotland. What a woose, eh? Here's an engorged tick. Note it's the size of a small pea and shiny. Horrid, yes, I agree. Gives me the creeps. Pen top gives an idea of scale. I found this one - oh horror - on the carpet on the upstairs landing and I hope - in fact, I'm sure - it came off the dog. Somehow we missed it. I have included a pen-top as comparison so you get an idea of what a well-fed tick looks like. And it was very much alive and waving its little legs around when I took the picture. Eeek. Actually, the last tick that attached itself to me I found while in the shower and, trust me, you wouldn't have wanted a picture of where that one was. Oh heck…here’s another one. Please note this is still the dog - it’s not my hair. Early September, weather mild, ticks still active. ….and rotate. Tick hook in action. The picture on the page-header is of the Speyside Way, just west of Portgordon, on the Moray coast, and both the dog and me have come home with ticks from an adjacent field. "How do I get the *!*@*! * thing off me?" Look, I said, keep calm. It’s best to use a tick hook. "But I haven’t got a *!*@*! * tick hook!" No, that’s the problem for most of us. We must have bought quite a few since we have had dogs. We keep the hooks in a safe place, then two things happen. Firstly, we can’t remember the safe place and second, even if we did remember, it probably isn’t close to us when we need them, possibly out in the country with the infernal creature sucking the lifeblood out of one of us, or the pooch. The moral here is obvious, would't you say? Just a second, it’s in the drawer somewhere......Anyway, you can buy these hooks on line right here, or from veterinary surgeries, pharmacies, even outdoor clothing retailers. A smooth rotating motion is necessary to make sure you get the beastie out cleanly. Rather worryingly, the health page with the link below says you should pull steadily without rotating, but I think that's when you are using tweezers. The tick hook people definitely say rotate. You definitely don’t want the whole sucking process to go into reverse during the operation. What I am trying to say is that you don’t want the blood back if the thing has ingested it. 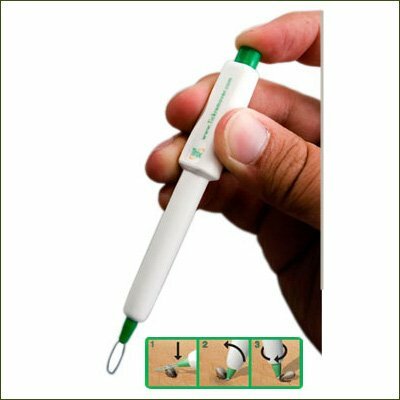 This clever device was brought to our attention, as an alternative to a hook, as sometimes things can go wrong, as we hint at above. This tick lasso is easier to use and gets some five-star revues. So you should take a look at that as an easier option. 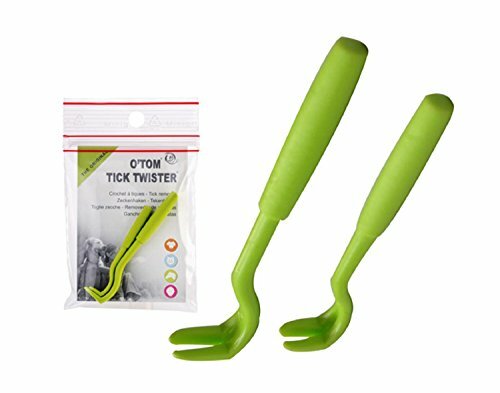 Another five-star tick remover is on Amazon for US and UK visitors on that link. It works for humans and pets. Take a look. We haven't checked this one out yet. Brave folk, such as our friend Veronica, tackle tick removal from dogs using only fingernails. If we happen to be with her at the time, we tend to scream and run away. Frankly, I wouldn't recommend dealing with ticks this way at all. Obviously, the best advice is not to get the things on your skin in the first place. If you have been anywhere in the outdoors with longish vegetation – bracken is notorious - then check your clothing afterwards – say, before you get back into the car. Repeat: you are looking for very small spiders. How do I avoid ticks? Ticks in Scotland. She got a tick bite while sitting right there! STAY ON PAVEMENTS AT ALL TIMES. SIT IN PUBS A LOT. No, seriously – and it is serious – I would repeat: don’t go brushing through heather, long grass or bracken with bare legs or arms. However, try explaining that to the dog. Maybe you want your faithful friend treated with preventative medication. We used to refer to it as ‘front-lining’ the dogs, after one of the brands. Treatments usually last for about a month. However, I should confess now that we don't use chemical treatments on our little dog, as some of the treatments have been associated with fits and other side effects, especially in terriers. OK, the jury is out on that one, but if you are a pet owner I suggest you do some on-line research. Try putting "side effects of flea and tick medication" into your favourite search engine. But do this after you've read all of this page, will ya? Personally, after a lifetime of striding around hill and glen, field and forest, I have had bites, oh, a few times. And Johanna once sat on the top of a cliff - the occasion is actually pictured above - enjoying views of a seabird colony and then later – oh, horror, she found a tick attached firmly to her side, below the waistband. So keep your shirt tucked in as well! By the way, you might by now want to take a look at some tick-proof clothing and accessories. As for organic repellents, we make no claims other than the observation that we rub oregano oil on to our terrier's coat if we think we are going to be out in tick territory. So far that's been 100% successful, though, to be plain, there are times when we forget to put it on him! Apparently a variety of essential oils as well as oregano are said to give some protection. At the time, there is no pain with a bite, though the site can be itchy after removal. You don’t want redness, especially spreading redness, to result, in which case medical advice should be sought. (Again, I can remember removing one from the back of J’s arm. Two days later there certainly was a red linear patch from it. A small percentage of these insects carry Lyme Disease, an unpleasant illness with flu-like symptoms and worse. While the worst place to find them is on you (obviously), I think the second-worst place to find them is at home on the carpet, swollen up. Then you just have to hope it fell off the dog and not you. Ticks are certainly not confined to Scotland – they are very widespread in other parts of Europe and beyond, but Scotland has a lot of wild country. Ticks and a global warming connection? Strangely enough, I roamed about the countryside as a boy and never once heard of ticks, but there is an increasing awareness of them today. The theory - or, at least, the story going the rounds - is that the milder winters in Scotland these days are allowing a greater number of ticks to survive. They don't get killed off and the result is higher numbers at the beginning of the season. Another symptom of global warming, perhaps? However I should point out that during the heatwave part of the summer of 2018, ticks seemed to be lying low, only appearing when the weather cooled. When ticks are not spoiling your country break, they feed off a wide range of other animals, wild and domestic: sheep, hare, deer, foxes, etc. The bottom line is: don’t for a moment let these insects put you off your enjoyment of the country here – but be aware and be sensible. Here is some good information about ticks in Scotland. (All you ever need to know, plus some pictures). And I found this information that even includes a map of places that have high densities of ticks in Scotland. So, compared to these critturs, midges in Scotland are, well, comparatively friendly. Scottish clegs, though, now they are something else. You’ll still visit though, won’t you? I've never picked up a tick, say, in Edinburgh! Finally, here’s a correction - no, a slap with a ruler across the fingers - I received from a kind reader, after I referred to the beasties as ‘insects’ on this page. So wrong…and now changed in the text. My Border terrier is now worried I will mistake him for a fish, possibly a dogfish.